I was sent information after the fold by Williams College Professor Neil Roberts, the books’s editor, and responded with an inquiry clarifying how the alleged “rising scholars” were selected. I’ve heard of Angela Davis and Nicolas Bucolla (when I told an intern of his I would not do pro-bono research for her into the New National Era) but otherwise I’ve never heard of nor corresponded with any of the scholars. Professor Roberts said he was familiar with my work and not bound by the academic insularity that, in my opinion, has suppressed the field of Douglass Studies for generations. I decided even as the book appears to be a compilation of mumbo-jumbo academic word salad scholarship — i.e. “hemispheric thinker” as descriptive praise — it is a new work of Douglass Studies. Therefore it deserves attention on principle of uplifting scholarship. Personally, this philosophical scholarship appears a striking resemblance to its first-cousin … speculative scholarship. 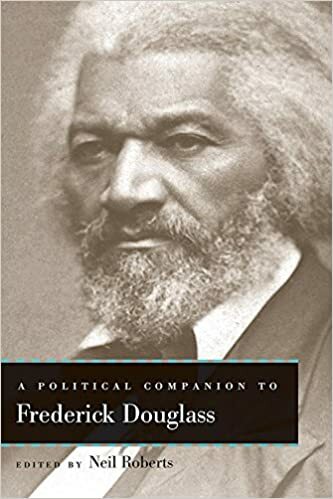 We hope A Political Companion to Frederick Douglass (2018) mentions at least two Supreme Court Justices, three Senators, four Congressmen and a President other than Lincoln. The political network of Douglass and its implication has yet to be advanced by scholars. We hope. We always do. Prof. Roberts is a young Douglassonian scholar. This generation of Douglassonians, and the next, must build an entire infrastructure of Douglass Studies that scholars of Lincoln, Twain, Dickens, Dickinson, Poe, Whitman and others have enjoyed for decades. In our limited understanding of the nascent field of Douglass Studies, Prof. Roberts and Johns Hopkins University Prof. Lawrence Jackson are the only two men of African descent engaged in the work of uplifting scholarship. We understand the limitations of the university and commend these two scholars for their important work. Lastly, we have on open invitation to Prof. Roberts, and all other educators, to walk Old Anacostia and see what Dr. Douglass saw. Frederick Douglass (1818–1895) was a prolific writer and public speaker whose impact on American literature and history has been long studied by historians and literary critics. Yet as political theorists have focused on the legacies of such notables as W. E. B. Du Bois and Booker T. Washington, Douglass’s profound influence on Afro-modern and American political thought has often been undervalued. In an effort to fill this gap in the scholarship on Douglass, editor Neil Roberts and an exciting group of established and rising scholars examine the author’s autobiographies, essays, speeches, and novella. Together, they illuminate his genius for analyzing and articulating core American ideals such as independence, liberation, individualism, and freedom, particularly in the context of slavery. The contributors explore Douglass’s understanding of the self-made American and the way in which he expanded the notion of individual potential by arguing that citizens had a responsibility to improve not only their own situations but also those of their communities. A Political Companion to Frederick Douglass also considers the idea of agency, investigating Douglass’s passionate insistence that every person in a democracy, even a slave, possesses an innate ability to act. Various essays illuminate Douglass’s complex racial politics, deconstructing what seems at first to be his surprising aversion to racial pride, and others explore and critique concepts of masculinity, gender, and judgment in his oeuvre. The volume concludes with a discussion of Douglass’s contributions to pre– and post–Civil War jurisprudence. Neil Roberts is associate professor of Africana studies, political theory, and the philosophy of religion at Williams College. His book Freedom as Marronage is the recipient of awards from the American Political Science Association Foundations of Political Theory section and Choice magazine, and the Association for College and Research Libraries selected the work as a Top 25 book for 2015. He is president of the Caribbean Philosophical Association.